The Matrix Removal System reduces waste and increases productivity of narrow web label and converting presses by eliminating costly press stops for waste roll removal and by reducing tension-related matrix breaks during the run. 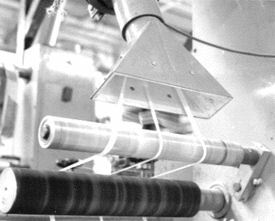 The aspirator is mounted on the matrix rewind shaft of the press and aligned with the matrix as it leaves the stripping roller. The ring compressor generates strong airflow which is diverted in the aspirator to create powerful suction on the inlet side and a high-velocity air stream on the outlet side. As the pressure-sensitive matrix is pulled into the aspirator, it collapses and sticks to itself to form a rope of material which can travel easily through discharge tubing to an accumulating area or compactor. The lubricant system (standard) assures that the matrix will not stick even if the compressor is shut off while the matrix is still in the discharge tubing. It consists of a storage reservoir, feed tube, drip regulator, site glass, and shutoff valve. This gravity-operated system feeds a controlled amount of vegetable oil to the aspirator where the fast-moving airflow disburses it, creating a slick coating throughout the entire system. Vacuum is in inches of H2O. All voltages are 3 phase 60 Hz.